Wann / Wer :	Geniesser, Frauen, Kenner, als eine Alternative zum Wein, nicht nur die Mädchen mögen es "süss"
Keg (as Honey Brown Ale, 6%) at Brauhaus Sternen, Frauenfeld. Hazy nut brown, creamy head. Aroma of honey, caramel and maple syrup. Sweet with medium body and rounded mouthfeel. Honey and caramel. Low bitterness. Bottle from Drinks of the World Zurich. Dark brown body with slight head. Nose is malty, sweet, honey. Taste is malts, caramel, some honey. Sweet, syrupy texture. Pretty good. Bottle from Drinks of the World, Bern. Cloudy brown pour with almost no head. Completely lifeless in fact. Big honey and malt aroma. Malty, medium sweet flavour. There is little on the palate. Nice enough to drink, but its no classic and unsuitable for a session. 0.33 l bottle, thanks Timo P! Hazy copper color. Sweet honeyish, fruity and citrusy aroma. 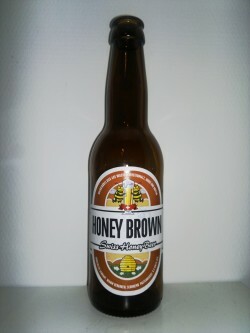 Flavors of flowery and fruity honey with toffee. Pours hazy golden-brown with thin white head. Aroma of honey, malt, spices. Very sweet taste, some very faint bitterness in the aftertaste. Medium body, lively carbonation. Bottled. A hazy amber beer with a beige head. The aroma has notes of straw and malt. The flavor is sweet malty with notes of straw. Thanks joergen for sharing. Bottle at yespr. Hazy orange coloured with a small white head. Sweet and fruity aroma of caramel and honey with notes of alcohol. Sweet and fruity flavour of caramel and honey. Sweet finish.